IMPRESS is a one-day observational study on sepsis and septic shock carried out by ESICM and SCCM under the framework of the SSC. Launched to mark World Sepsis Day, IMPRESS aims to determine the incidence and clinical patterns of septic syndromes on a single day in ICUs and Emergency Departments worldwide. Participating hospitals collected data on November 7, 2013 using web-based and paper audit collection tools. 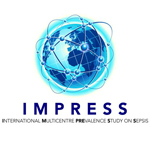 The Surviving Sepsis Campaign bundles and outcome: results from the International Multicentre Prevalence Study on Sepsis (the IMPreSS study) Intensive Care Medicine (2015) June [ONLINE FIRST]. Andrew Rhodes; Gary Phillips; Richard Beale; Maurizio Cecconi; Jean Daniel Chiche; Daniel De Backer; Jigeeshu Divatia; Bin Du; Laura Evans; Ricard Ferrer; Massimo Girardis; Despoina Koulenti; Flavia Machado; Steven Q. Simpson; Cheng Cheng Tan; Xavier Wittebole; Mitchell Levy.